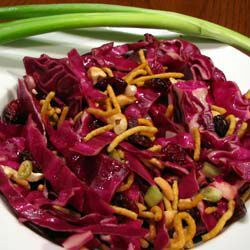 This Crunchy Red Cabbage Salad, contributed by English friends of Giora Shimoni who moved to Israel, is tasty, healthy, and easy to prepare. The hummus sticks, dried cranberries and cashews are all optional additions, as the salad is good even without these treats. The dressing in the original recipe did not specify vinegar type, but apple cider vinegar produced tasty results. The original dressing recipe included 1/2 cup vinegar, 1/2 cup sugar, 1/4 cup oil, and 1/4 cup soy sauce. I found these proportions made for a very sweet dressing that was high in sodium. I adjusted the proportions below to give the salad a healthier nutrition profile, and to let the flavors of the cabbage, scallions, and cranberries shine through. The recipe calls for chopping the cabbage, but you can also shred it with a food processor or large chef's knife if you prefer a slaw-style salad. 1. In a large bowl, toss together the chopped cabbage and scallions. Just before serving, add the hummus sticks, cranberries, and/or cashews if using. Toss again to coat all of the ingredients in the dressing.